Bringing their imaginative and evocative approach to a classic acoustic western string-band line-up--fiddle‚ guitar‚ Dobro‚ accordion‚ upright bass‚vocals--Portland‚ Oregon-based Black Prairie combine bluegrass‚ Appalachian modes‚ gypsy/cowboy swing‚ and European café music with vivid compositional energy to create a textured‚ cinematic listening experience. Three of the five musicians are members of the Decemberists‚ and that often comes through in the way the music takes on not only narrative flow‚ but a strong sense of mood and sonic terroir-- whether that of a skittering eastern European village dance or a lonesome prairie lament. "Ostinato Del Caminito‚" for example‚ summons a sense of journey‚ as Chris Funk's warm and melodic Dobro‚ Jenny Conlee's dramatic accordion‚ and Annalisa Tornfelt's timbre-rich fiddle assay an ever-changing sonic terrain that manages to harmonize elements as disparate as surf-y reverb-spring splashes and stomping Bartok-ian rhythms. With its smoky‚ dusty‚ vocals and dark-cloud fiddle and cello‚ the song "Crooked Little Heart" sounds like some kind of frontier noir; a broken-hearted slow-dance in an almost-abandoned town. 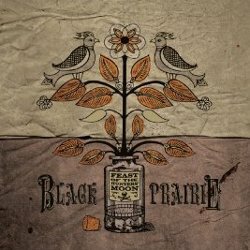 The most subtle of Black Prairie's considerable strengths are evident on the melancholy instrumental "Atrocity at Celilo Falls‚" wherein the Dobro sings elegantly and open-heartedly in interweave with fiddle‚ accordion‚ and mellow toned acoustic guitar‚ all of this eventually dissolving into lush and dreamlike sonic treatments. "Single Mistake‚" with its intimate vocal at the center‚ offers the quiet and contemplative uplift of a campfire lullaby‚ the instrumentalists sharing and trading off restrained but expressive melodic lines‚ and then a gentle sing-a-long chorus fading into the echoing distance. It's these carefully-wrought moods and evocations that make Black Prairie's first album so engaging. Combined with especially fine ensemble musicianship and strong sense of sonic surprise and depth-of-field‚ it all makes for a record worth coming back to again and again.